Cookies and Cream Cheesecake Cupcakes, sounds like a mouthful and it certainly is. Albiet a sinful, decadent and deliciously messy mouthful. I’m not really sure what inspired these Cookies and Cream Cheesecake Cupcakes, but for some reason, I couldn’t get the idea of cupcakes frosted with cheesecake instead of frosting out of my head. What could be bad about combining cookies and cream, cheesecake and cupcakes together? Nothing! So to start with we have my all time favourite chocolate cake, Ina Garten’s Beatty’s chocolate cake. It’s dark, sticky and deliciously chocolatey. Then, we have not just any cheesecake frosting but a cookies and cream cheesecake frosting. Finally, and perhaps this is gilding the lily but I couldn’t help myself, it’s all topped off with a thick chocolate fudge sauce. Sinful, delicious and just SO good that it’s not even 10am and I am contemplating having a second Cookies and Cream Cheesecake Cupcake! Make these Cookies and Cream Cheesecake Cupcakes and your children, husband, boyfriend, girlfriend or significant other will love you forever. Preheat the oven to 175 Celsius (350 Fahrenheit) and line two 12 hole cupcake trays with paper liners. Combine the flour, sugar, cocoa, baking soda, baking powder, and salt into the bowl of an electric mixer fitted with a paddle attachment and mix on low speed until combined. In a large jug add the buttermilk, oil, eggs, and vanilla and whisk to combine. Turn the mixer on to it's slowest speed and gradually add to the dry ingredients. Then add the hot water and mix until just to combined. Pour the batter into the prepared liners and bake for 15 minutes or until a cake tester comes out clean. Cool the cupcakes in the pans for 20 minutes, then place onto a cooling rack and cool completely before frosting. To make the cookies and cream cheesecake frosting add the chocolate biscuits to a food processor and process to create relatively fine crumbs. Keep in mind that the cheesecake mixture will be piped so make sure there are no large chunks, if so remove. Place the cream into a large bowl of an electric mixer and beat using a paddle attachment on high speed whilst gradually adding half the sugar. Beat until soft peaks form before switching the mixer off and adding the cream cheese. Beat again while gradually adding the rest of the sugar until stiff peaks form. Add the crushed biscuits and fold through. Place in the refrigerator while you make the chocolate fudge sauce. To make the fudge sauce combine the cream, brown sugar, honey and butter in a saucepan over a medium heat. Bring to a boil and reduce to low and simmer for 5 minutes. Remove from the heat and add the chocolate and vanilla extract and whisk until smooth. Fit a piping bag with a star shaped tip and fill with the cookies and cream cheesecake frosting. 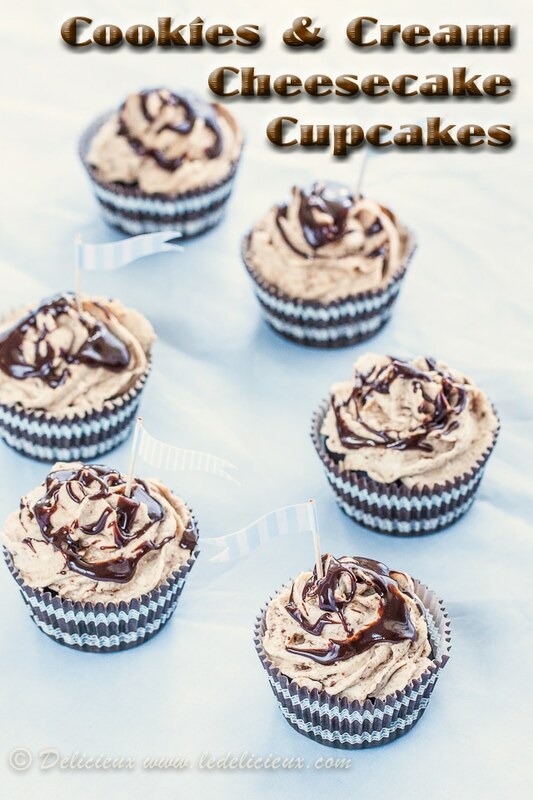 Pipe onto the cooled cupcakes before drizzling with the chocolate fudge sauce. Refrigerate until ready to serve and refrigerate any remaining cupcakes in a sealed container for 3 days. This is amazing combination, what a yummy treat. I’ve featured this recipe on my blog, hoping that you don’t mind, but if you do, please contact me and I’ll remove it. All the best. I just have to say… WOW. This was my first attempt at ‘from scratch’ cupcakes and WOW. The only thing I did different was used olive oil and not vegetable oil. This was the most Delicious cupcake I have ever had!!! I also think that maybe having the cream cheese all the way soft instead of ‘slightly soft’ would help with the lumpy frosting I got. Highly recommended recipe!!! Mouthful or not – these look amazing! These are so darn cute! Love the chocolate drizzle on top. These sound heavenly! I love all things cookies and cream, but have yet to try it in cupcake form. Love, love the photos – they are so beautiful! Made these cupcakes on the weekend and they were divine. My husband can’t stop raving about them! Can’t believe how light the cake batter was. Did you realise you left vanilla out of our ingredients list! I assumed it was one teaspoon. Thank you, and your blog is great, I have never made one of your recipes that has disappointed me! Hi Gail. 😀 Your comment made my day! 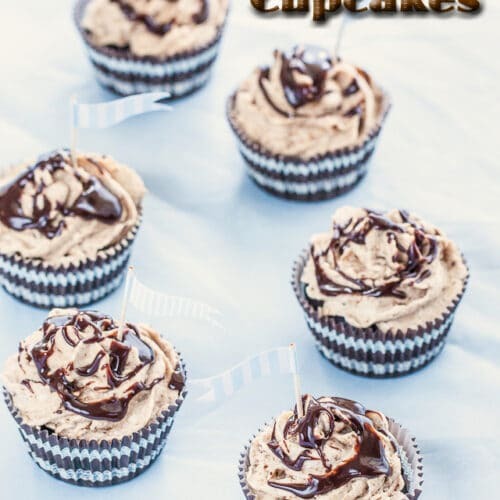 Thank you so much for taking the time to leave a comment and let me know how the cupcakes turned out, and the other recipes you’ve tried. I’m so happy you and your husband enjoyed them! And yes, I realised I missed the vanilla extract, and amended the recipe yesterday. Yes, I totally agree. My kids and husband will love me forever if I can pull off making these cupcakes! I love the little flags on these cupcakes. These little things make your cupcakes so irresistible and special! These sound and look incredible! Sinful is definitely the word! These look delicious! I am making them now but I’ve got to the section where I have to add vanilla and there is no mention of vanilla in the ingredients list! How much should I add? Sorry, I am just not such a great cook unless I follow instructions, lol. I will learn. It’s 1 tsp of vanilla extract. 😀 Sorry, I forgot that. These look divine! So decadent. Beautiful job! Gorgeous cupcakes! I love cookies & cream anything! These look sinful! That does look sinful and the name is enough to make people fall in love 🙂 beautiful presentation and as always .. lovely lovely light! I ahve a standard one bowl chocolate cake recipe I normally use but your description of Ina Garten’s is making me scrap my normal recipe and try hers. Lovely combo here and I’m sure both my daughter and husband will surely love me forever if I made them these! Definitely sinful but oh so worth it! What a sinful indulgence..can polish off all from my screen! Lovely clicks Jennifer. these just look perfect, so pretty and i love the incorporation of cream cheese. You truly are a cupcake queen! My stomach literally did a backflip when I saw these….in a good way! Jennifer, the idea of cheesecake frosting is just crazy brilliant! I’ve had cream cheese frosting before but calling it cheesecake and adding biscuits is so clever! These look utterly irresistible! Definitely saved, just wow! These look delicious. I love the cupcake papers and the flags, too. Oh WOW! These look sinfully delicious, Jen! LOVE the frosting and your pictures are just stunning. Ok Jennifer, these are genius!! So sinfully decadent! I need one of these! Oh lord. The cupcake just went into overdrive. And I can’t help myself now…. I am sure I’d love to try a homemade version of this. Thanks for sharing. This looks aaaahhhmazing!!! I haven’t made cupcakes in foreevvver! Oh my goodness Jen these are very decadent! They look worth the naughtiness though. Yum yum yum! What gorgeous cupcakes and flavor combination! Cute flags and cases. Okay I seriously want one or ten of these right now. Oh my, cookies and cream cheesecake frosting? Must make very, very soon. holey moley these are SUPER cupcakes!! I feel like I’ve been given a gift with this post. 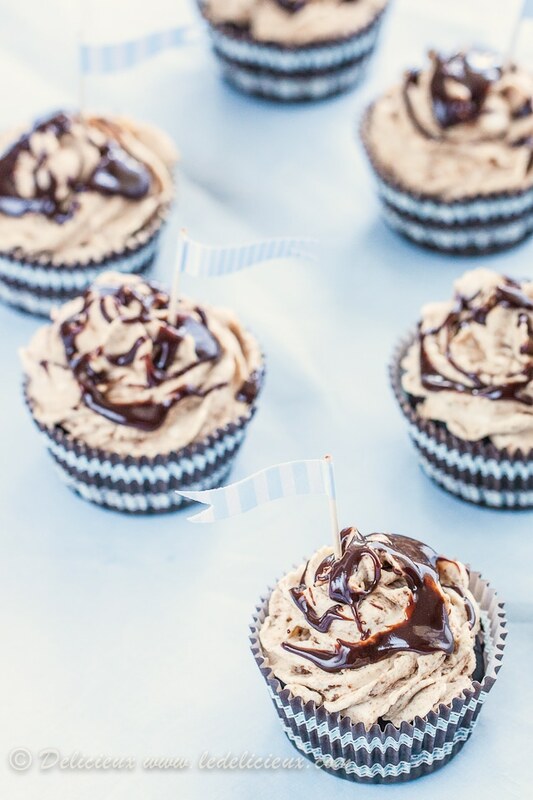 These cupcakes are amazing and my mouth is watering just looking at the photos. Imust make thes! These look so sinful and delicious! I love the cookies & cream cheesecake frosting and the chocolate fudge sauce combo. Also, your baking cups/flags are too cute!